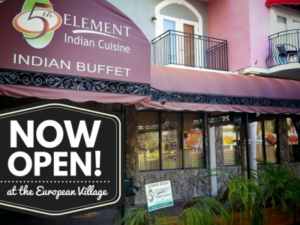 The My 5th Element Indian Cuisine offers the best of colorful and flavorful dishes from the Indian cuisine while maintaining a fresh and health approach. Only the finest spices and ingredients from around the world are used to put together a truly tantalizing menu. Dishes range from the subtle tastes to the intense flavors and spices! Ideal for those with a very mild and delicate palate to those who prefer even more spice! The restaurant also features Western dishes. Menu changes on a regular basis. Expect friendly staff and great service while dining here. At 5th Element Indian Cuisine, classic dishes are revolutionized into modern interpretations without losing its fundamental elements. Made with high quality and fresh ingredients, 5th Element Indian Cuisine will satisfy your needs. Lunch is offered as buffet. Dinner is a-la-carte.